One of the greatest lines in the series is the profile of female leaders, what stimulates us to think about the female leadership in politics. In May 2014 she was named one of the world’s most powerful women by Forbes, which noted that she “has been given the difficult task of managing the ruble exchange rate during Ukraine’s political crisis and facilitating growth for an economy trying to avoid a recession”. Ksenia Sobchak is a famous Russian journalist and a politician. She is also widely known for hosting several TV shows in Russia. Irina Khakamada was an elected Duma representative from 1993 to 2003. She is commonly regarded as a democratic politician. By now Irina Khamada is widely known and respected largely due to the ideas, which she spreads during her public speeches, lectures and etc. Maria Zakharova is the Director of the Information and Press Department of the Ministry of Foreign Affairs of the Russian Federation and she is the first woman in the history of department to hold this position💪Spokeswoman for the Ministry of Foreign Affairs of the Russian Federation from 10 August 2015. In 2016 she was chosen as one of BBC’s 100 Women. Valentina Matviyenko is a Russian politician serving as the Senator from Saint Petersburg and Chairwoman of the Federation Council since 2011. Being the first female political leader in Saint-Petersburg Matviyenko developed a large number of megaprojects in housing and infrastructure, such as the construction of the Saint Petersburg Ring Road, including the Big Obukhovsky Bridge, completion of the Saint Petersburg Dam, launching Line 5 of Saint Petersburg Metro, and starting land reclamation in the Neva Bay for the new Marine Facade of the city (the largest European waterfront development project)containing the Passenger Port of St. Petersburg. 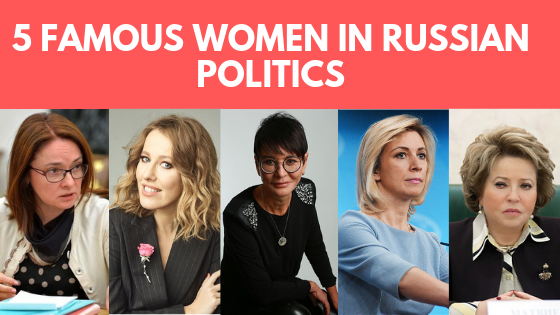 We are eager to learn about women in political processes of your countries, so you are very welcome to share your insights in comments!